or: Rapunzel! Let down your hair! One word to sum it up: Charming. After receiving the healing powers from a magical flower, the baby Princess Rapunzel (Mandy Moore) is kidnapped from the palace in the middle of the night by Mother Gothel (Donna Murphy). Mother Gothel knows that the flower's magical powers are now growing within the golden hair of Rapunzel, and to stay young, she must lock Rapunzel in her hidden tower. 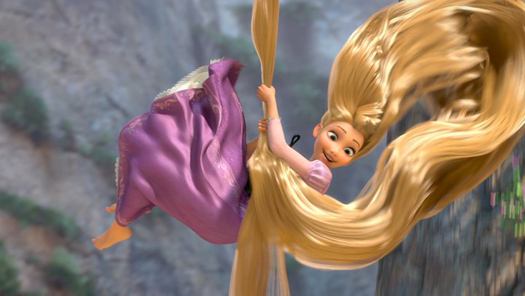 Rapunzel is now a teenager and her hair has grown to a length of 70-feet. The beautiful Rapunzel has been in the tower her entire life, and she is curious of the outside world. One day, the bandit Flynn Ryder (Zachary Levi) scales the tower and is taken captive by Rapunzel. Rapunzel strikes a deal with the charming thief to act as her guide to travel to the place where the floating lights come from that she has seen every year on her birthday. Rapunzel is about to have the most exciting and magnificent journey of her life. Its quite surprising that the Academy decided to go for only three nominations in the 'Best Animated Feature' category, meaning that this and Despicable Me missed out on a spot. However, Tangled managed to receive a well deserved Oscar nomination for Best Original Song-'I See the Light'. Last year, The Princess and the Frog served as a 2D animated musical spectacular, but this year, Tangled steps it up a notch by being a 3D animated musical spectacular. I never saw it in 3D, but the visuals were pretty amazing. Really, its the vocal talents of Mandy Moore and a surprising Zachary Levi which steal the show here. They're never too overreactive with their vocal acting, and their voices suit the songs perfectly, making this not become one of those phony-star-studded-animated-flicks. The songs, written by Alan Menken, are spellbinding, even if some of them are particularly uninspired. They fit well with the story, which is masterfully told through several interesting characters. Of course, we see the usual suspect animal sidekick, but times two, with the cute chameleon Pascal and the scene stealing horse Maverick. Like I do in most animated films, I found myself in tears at the end, but that only came after lots of decent laughs. In short, I loved Tangled. It was a beautiful ode to the story of Rapunzel. THE VERDICT: Tangled is a stunning example of why Disney animated films still rule, with great vocal talents to boot.